This Greeting Cards software will enable you to create fully customized printable greeting cards and post cards in different sizes. Once created print your printable greeting cards at home (requires a key) or send them to print with Digilabs. (And the Software is Free). With this greeting card software easily design and print your personal greeting cards for Announcements, Holidays, and any other occasion. With My Photo cards software included hundreds of clip art backgrounds you can add to your cards. Design Tools - use layers of text and images, create collages, crop images, make fade images, re-shape images to be round or oval, use grip to easily place text any ware, add frames. 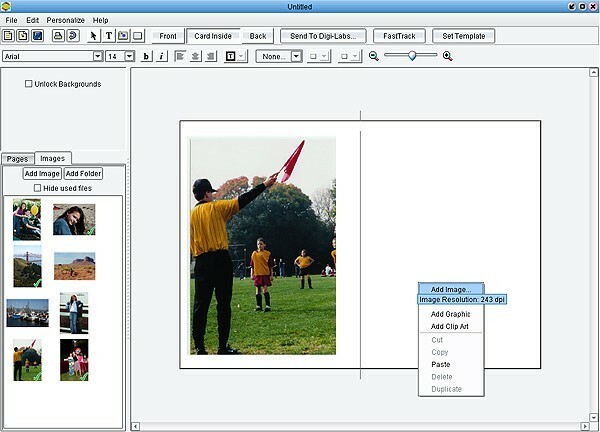 This card software works with different U.S & European paper sizes. And users can easily create the card at any language. This photo card software enables to easily personalize your cards with text at any location - and any number of images at any location. Select fonts colors and images.